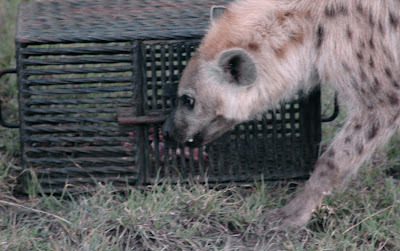 In the Kenyan wilderness, hyenas facing a meat-stuffed puzzle box performed impressively—impressively badly, that is. Researchers expected the animals to be up to the challenge, but few of them ever got the box open. Now, repeating the experiment with captive hyenas, they've discovered that there's no contest: the captive animals are better problem solvers. Out of 62 wild hyenas in last year's study, less than 15 percent ever managed to slide the latch and swing open the door of the barred metal box. Despite multiple chances, most of the animals were losers in this game. But lead author Sarah Benson-Amram observed certain behavioral traits shared by the winners. Hyenas that tried more techniques to get the box open (biting, dragging, flipping the darn thing over) had greater odds of success. And hyenas that were less "neophobic"—that is, less wary when approaching a new object in their environment—also did better. Previous studies with primates and birds had suggested that captive animals are both less neophobic and better at problem solving than wild ones. So Benson-Amram repeated her experiment on a group of hyenas living very far from their homeland, in Berkeley, California. This group was smaller than the wild hyena group, with only 19 animals tested. But three-quarters of them solved the puzzle, Benson-Amram reports in Animal Behaviour. And every successful captive hyena got the meat on its first try—unlike the wild animals, most of which needed more than one trial before they figured it out. Although the wild and captive animals belonged to the same species, you would get very different impressions of hyenas' problem-solving smarts if you only looked at one group. Benson-Amram ruled out a few possible explanations for that difference. Did well-fed animals have more energy for solving the puzzle? In the wild, high-ranking hyenas ate more but didn't do any better with the puzzle box. Were hungrier animals more motivated? Skinny hyenas had no advantage either, and captive hyenas didn't lose interest after eating. Two explanations, though, held up. One was neophobia. In the wild, animals that were more cautious about approaching the manmade box were less likely to crack it open. Captive animals were overall less neophobic than wild ones. This isn't surprising, since they're used to living around humans and our metal objects. The second notable difference was that captive hyenas tended to try more behaviors (biting, digging, pulling, and so on) than wild hyenas did. Benson-Amram thinks this has to do with distraction. "It’s almost akin to giving a puzzle to a civilian in an active war zone versus giving one to a person in the comfort of their living room," she says. The wild hyena is busy watching out for predators, rather than wondering whether pushing and biting at the same time might get this box open. "The person in the war zone would likely give much less mental focus to the puzzle since they have to constantly look over their shoulder," Benson-Amram says. Or maybe the comfortable home isn't the right analogy for the captive hyenas. "Imagine giving a puzzle to a person in solitary confinement," Benson-Amram says. "That person may be much more excited about the puzzle and interested in solving it than the person in their living room who has TV, books, their family, and other fun diversions." She adds, "I am not trying to say that zoos are as bad as solitary confinement." But captive hyenas clearly live in a more predictable, less stimulating environment than the Kenyan savannah. Not all the hyenas learned how to open the box. But scientists learned something that might be critical. When researchers are wondering about the "maximum cognitive abilities" of a species, Benson-Amram says, captive animals may be better subjects. When they want to know what a species is capable of in the wild, though, they should remember that it's a war zone out there. Image and video courtesy of MSU. Great article and summary. Thanks so much for posting. This is really interesting! I wonder whether, in the long run, the neophobes in the wild actually do better -- I imagine that captive hyenas will rarely, if ever, be injured by trying to engage with an new object in their habitat, since zookeepers wouldn't put it in there if it had the potential to be harmful. So they might be pretty cavalier about what new things they're willing to do with foreign objects. But in the wild, that might get you killed... mess with a seemingly dead or unmoving animal, eat a poisonous plant, bother a wasp's nest, and you're in trouble. That could balance out, though, with the extra food the cavalier hyena might uncover. Fun to think about!